In Ideal Gas for Chemistry, experiments focus on Charles' Law, Avogadro's Law, partial pressure, density, and more. 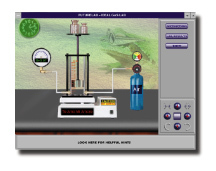 Students have the option of conducting predefined experiments or creating their own experiments using a variety of gases and equipment, including piston chambers, fixed-volume chambers, hot plates, and thermometers. Boyle's Law is the focus of the experiment shown below. Boyle's Law states that at a constant temperature, the volume of gas is inversely proportional to the pressure. By filling the piston chamber with air and recording the pressure before and after adding standard masses to the top of the chamber, students can determine the effect of pressure on the volume of gas. Each experiment features a Practice and several Standard Setups. 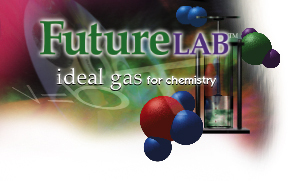 FutureLab is currently also developing two new simulations for chemistry: Basic Titration for Chemistry and Chemical Equilibrium.